Another reason you don’t want to miss OCRA’s Turn Up the Heat! Not only does the event feature fabulous tastings from DC’s female culinary stars—we are thrilled to announce that the amazing Chef Elle Simone, from PBS’ America’s Test Kitchen will be our host! 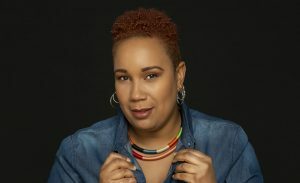 Elle Simone Scott began dazzling the culinary world in 2003, and quickly became a highly sought after freelance Food Stylist and Culinary Producer. Elle has collaborated and contributed her unique styling abilities to Food Network, Food Network Magazine, The Cooking Channel, The Katie Couric Show, CBS Corporation, ABC’s The Chew and Bravo’s Chef Roble and Co.
Elle continues to inspire others as she is currently the resident Food Stylist & On-Air Talent on America’s Test Kitchen on PBS…the first African-American woman to do so! See Chef Elle, plus many more fabulous female foodstars, at Turn Up the Heat DC. This event has now passed. We hope to see you next year! Sign up for email updates so you don’t miss it!